Google is included in the Google, Yahoo, Facebook Revenue article. 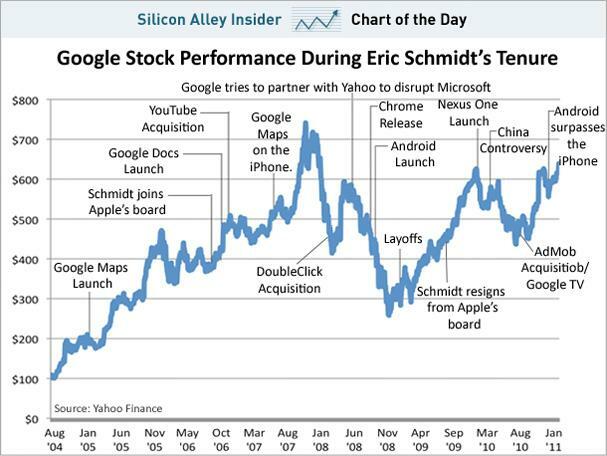 Here is a look at Google's stock performance under former CEO Eric Schmidt's tenure. With Eric Schmidt moving from CEO to Executive Chairman of Google, Larry Page becomes the new incoming CEO. Google's stock performance has taken an impressive rise during Eric Schmidt's tenure as CEO of Google. With pullback in 2008, recovery in 2009, a dip followed by recovery in 2010, is it poised to rise higher in 2011? Google has yet to make big on monetizing its YouTube asset. The Chrome market penetration is progressing but faces browser market share challenge against Internet Explorer and Firefox. Google's pullout from China in March/2010 did not help Google's revenue. Google TV penetrates the streaming video market. As Google continues to penetrate and grow business in various market segments including Fiber Optics Networks, Google stock is worth considering as Google aspires to become the ultimate one-stop brand of all time.